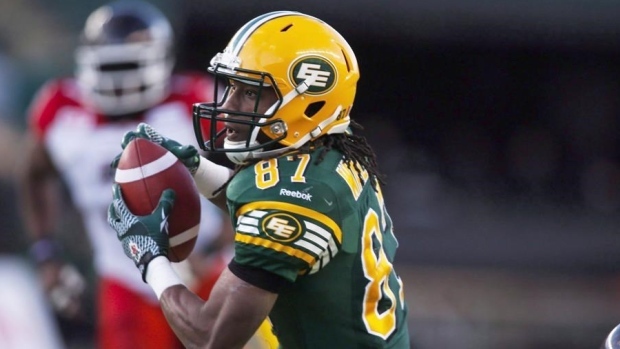 EDMONTON — The Edmonton Eskimos released receiver Derel Walker on Thursday to pursue NFL opportunities. Walker, 25, was scheduled to become a free agent next month. The six-foot-two 185-pound Walker spent two seasons with Edmonton and established himself as a big-play receiver. He was named the CFL's top rookie in 2015 after registering 89 catches for 1,110 yards and six TDs in 12 games. Walker helped the Eskimos cap their season by downing Ottawa 26-20 in the Grey Cup game in Winnipeg. Walker enjoyed an even better sophomore campaign. He had 10 touchdowns and was second in the CFL with 109 catches and 1,589 yards, finishing behind teammate Adarius Bowman in both categories.